Remember when President Obama told us how the health-care bill would cost $900 billion over ten years and yet would somehow end up saving taxpayers money? Well, here is the chart that shows it’s not true. 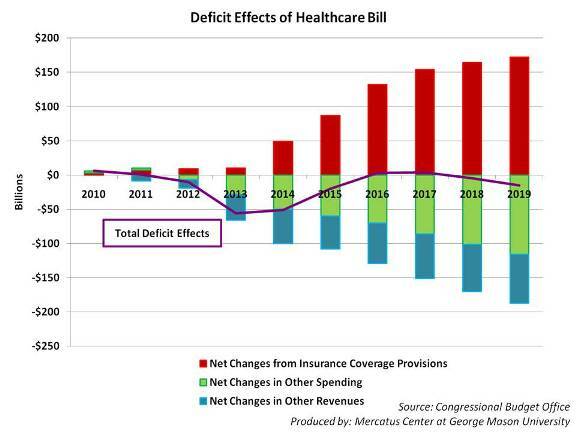 Using Congressional Budget Office projections, the chart compares the net change in deficits due to changes in insurance coverage (red), net changes in deficits due to other spending on Medicare, Medicaid, and other federal health programs (green), and net changes in deficits due to a $420 billion increase in federal taxes. Importantly, these long-term estimates suppose that spending cuts and tax increases are instituted as legislated. The purple line shows the year-end change in the deficit due to the final health-care legislation. This change of $143 billion over ten years is paltry when taken in context – this nation has spent an average of $1.8 trillion dollars on health-care during each of the past ten years. To put it another way, the net deficit reduction over the next ten years will be less than 1 percent of this year’s GDP, and less than 4 percent of this year’s federal spending. This deficit reduction does nothing to reduce the substantial pressure of growing health-care costs on the federal budget. But don’t take my word or data for it. Here is the CBO director, Dr. Douglas Elmendorf, on that exact topic (and the slides underlying his blog post). The presentation destroys the claims of the president and his allies about the effects of the new laws on federal health spending and the budget. In CBO’s judgment, the health legislation enacted earlier this year does not substantially diminish that pressure. In fact, CBO estimated that the health legislation will increase the federal budgetary commitment to health care (which CBO defines as the sum of net federal outlays for health programs and tax preferences for health care) by nearly $400 billion during the 2010-2019 period. Because federal health care programs make up a large share of the federal budget, putting that budget on a sustainable path would almost certainly require a significant reduction in the growth of federal spending on health care relative to the amounts projected under current law (including this year’s health legislation). Now, here’s what I’d like to know: Why didn’t the director of CBO say that before the bill was passed? Here’s a great post by economist Keith Hennessey making the same point and more. The data for this chart is here.